One of Apple’s new phones this fall is the iPhone XR. Apple finally revealed what the “R” means. Apparently, it’s an homage to “special” sports cars, according to Apple’s marketing chief, Phil Schiller. The newest Apple phones this year are called the iPhone XS and the iPhone XR. Apple insists that the “X” stands for the Roman numeral for 10. And the “S” stands for “speed,” at least in Apple lore. But what does the “R” stand for? According to Apple’s marketing chief, it has to do with sports cars. “I love cars and things that go fast, and R and S are both letters used to denote sport cars that are really extra special,” Apple’s senior vice president of worldwide marketing, Phil Schiller, told Engadget. So the “R” could stand for “rally,” or “type R,” or “road and track,” or anything really – there are a lot of cars that use “R” in their branding. 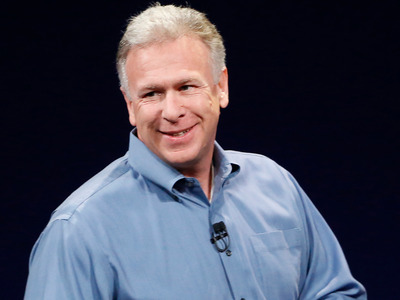 GettyPhil Schiller, Apple’s marketing chief. The iPhone XR, which starts at $US750, is slightly less expensive and has lower performance than the iPhone XS or iPhone XS Max, which start around $US1,000. Some cars that use the “R” or “XR” branding are budget models, like the Toyota Matrix XRS. But those letters can also denote a high-performance variation, like the Ford Focus RS. And some high-end sports cars use “R” as part of their model numbers, like the Jaguar XJR and the Audi RS 7. Schiller’s latest tweet about his favourite cars didn’t list any “S” or “R” models, though he does have a specific taste: fast, rare, and exotic. “So many favs to choose from: McLaren F1, Aston DB4 GT, Porsche 550A, Ferrari P4, Ford GT/40, Jaguar D-type, Lambo Miura,”Schiller tweeted in March 2012.